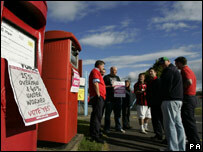 A two-week campaign of staggered strike action across the UK postal service has been announced by union officials. The rolling programme of walk-outs, to begin on Wednesday 25 July, will affect every aspect of the Royal Mail. It follows two earlier 24-hour strikes. "This is designed to hit Royal Mail harder at minimum cost to our members," the Communication Workers Union said. The union is locked in dispute with the Royal Mail over the company's 2.5% pay offer and modernisation plans. The strikes will see each section of the company from the sorting and collection centres to those involved with making the deliveries walking out on two separate 24-hour strikes over two weeks. With each division allocated a different day to strike, the action is designed to create continuous disruption to the UK's postal service over that period. The Royal Mail called the union's decision "hugely disappointing", but said it could not change its position. It also said it would have contingency arrangements in place. The CWU has repeatedly criticised the Royal Mail for refusing to negotiate with its officials over staff pay, working conditions and the group's modernisation plans, which they say could result in 40,000 job losses. Union officials argue that they support modernisation and the introduction of new technology and atomisation, but not in the manner that the Royal Mail has outlined. The CWU says that automation and modernisation could still be achieved without the swingeing job cuts. Royal Mail insists that change is essential if the business is going to survive against steep competition from a growing number of entrants in the UK mail market. The group has recently made representations to the UK mail regulator Postcomm to lift the price of its bulk business mail deliveries to claw back some of the 40% of market share it has lost to rival operators since it lost its monopoly 18 months ago. But other plans to modernise funded by a £1.2bn government loan, faces a fierce backlash from union officials. They say these are damaging not only for its workforce, but for Royal Mail's customers and the company. They argue that the restructuring programme agreed with the government would not save Royal Mail and called the plans "commercial suicide". In a letter to Royal Mail executives Allan Leighton and Adam Crozier, CWU's deputy general secretary David Ward said: "You need to understand you cannot transform the business by ignoring the views of the workforce. "If you continue to publicly refuse to negotiate you will be responsible for escalating the dispute." In addition, the CWU said it would be galvanising support from every single MP, across all trade unions and putting forward its case to the public through adverts in all the main newspapers. "Royal Mail remains ready to meet the union leadership yet again at any time to explain our position and the reality of the open marketplace in which we now operate," the company said.